Palo Alto, CA (USA) -- How do we alleviate pain and suffering? What is the mind? And, most importantly, how can we stop craving chocolate? These are some of the questions that the Dalai Lama, the exiled spiritual leader of Tibet, and a panel of neuroscientists and religious scholars tackled at a day-long seminar at Stanford University on Saturday. As part of his two-day visit to Stanford, the Dalai Lama was invited by the university's school of medicine to discuss the nature of the mind in an attempt to bridge the divide between religious doctrine and scientific study. "Insofar as modern science and Buddhism are engaged in exploring the mind, there is a commonality," the Dalai Lama said before a packed auditorium of about 600 people. Wearing his trademark tinted glasses and red robes and seated in the lotus position, the Dalai Lama engaged in a discussion on the mysteries of the mind with the country's leading neuroscientists. 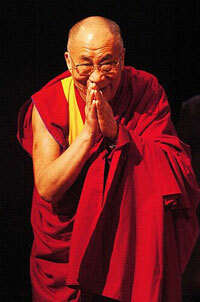 The Dalai Lama said he thought Buddhists have a lot to learn from science, adding, "weare a bit backwards." 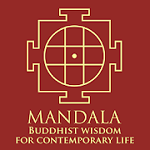 Dr, William Mobley, director of Stanford's Neuroscience Institute, agreed that Buddhism and neuroscience have a lot to learn from each other. "They both understand the importance of alleviating pain and suffering," Mobley said. While neuroscience is about genes, molecules and neurons, it is also about "how the brain allows us to understand ourselves," Mobley said. Buddhism, meanwhile, takes a different approach, that cultivating wisdom and insight can counteract suffering and unhealthy craving. The brain remains a mystery, yet scientists are beginning to unravel how it works — new revelations that clearly intrigue the Dalai Lama, who won the Nobel Peace Prize in 1989. One area neuroscientists are studying is craving and addiction. Understanding how we become addicted to alcohol, drugs, nicotine and even food can lead to cures to our most pervasive social ills, including obesity and alcoholism. Focus on the brain's so-called "pleasure centers" have led to research into dopamine neurons, which deliver powerful feelings of well-being. "We're beginning to understand the chemical ways to reduce craving," said Dr. Howard Fields, director of the Wheeler Center for the Neurobiology of Addiction at the University of California, San Francisco. The first drug to target craving is already in development. Called Rimonabant, it antagonizes the receptors that marijuana works on and can stop craving, Fields said. Giving people this drug can stop them from smoking and cause them to lose weight, Fields aid, eliciting audible gasps from the Stanford audience. "I ask His Holiness, is this really a good approach?" Fields said. The Dalai Lama replied that much depends on how you define craving. In Buddhist teachings, desire is not the same as craving. For instance, Buddha had a desire to alleviate the world's suffering, which was not a bad desire to have. Cravings, however, for drugs, food, wealth, power, recognition or even other people, are a falsification, a misinterpretation of reality. Such cravings lead to less understanding of self and keep the person locked in a cycle of suffering. "It's based on ignorance," the Dalai Lama explained. The Dalai Lama asked if a drug could be created to kill all cravings. Fields replied that such a drug would likely "create a state of coma. "That's a disaster," the Dalai Lama said, laughing. Fields agreed, adding "it would be the opposite of awakening. 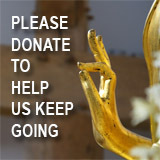 Even so, the basic philosophy of Buddhism goes against a drug to kill craving, said Alan Wallace, founder and president of the Santa Barbara Institute for Consciousness Studies. "The drug suppressing craving could stop you from developing the wisdom to understand and move on from craving," he said to loud applause from the audience. Fields countered that the drug could break the cycle of craving and allow the addicted person time and mental space to contemplate and recover from the craving. The Dalai Lama is scheduled to speak next week in Washington, D.C., at the prestigious Society for Neuroscience conference. More than 500 brain researchers have signed a petition urging the society to cancel the Dalai Lama's lecture, arguing that his views on meditation and mindfulness have no basis in science.